On a recent business trip to Bloomington, IL (yes, I have a real job), I was pleasantly surprised to find that this town had more than corn fields. 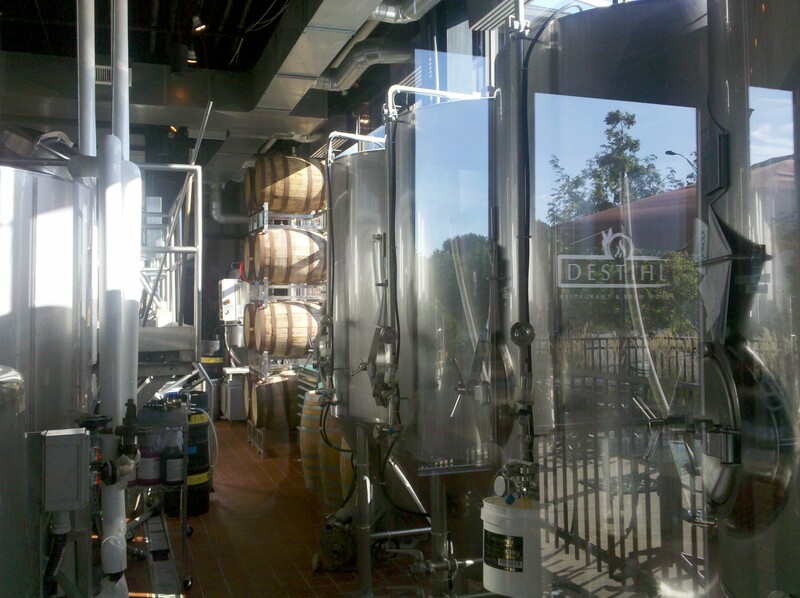 Located on the border of Bloomington and Normal, IL is a lovely little brewery that goes simply by the name Destihl. impressed by the large selection of brews on tap and even more impressed that they were really, really tasty. Strawberry Blonde Ale (5% ABV) – Fresh strawberry aroma and taste. This light, unfiltered blonde is sour, sparkly, clean, and crisp. Very nice. Raspberry Wheat Ale (8% ABV) – 125 lbs of raspberries went into this awesome beer. I described the Raspberry Wheat to my co-workers as “elegant and champagne like.” A very pretty pink color, raspberry aroma and flavor with a very crisp finish. This wheat ale is also unfiltered and has a wonderful sweet/tart flavor. The Raspberry Wheat was a favorite at our table. Weissenhemer Hefeweizen (5.9% ABV) – Light to medium gold in color, the hefeweizen was lemony, mild, and easy to drink. Again, unfiltered, it had a nice mouth feel and light, clean finish. Drunken Weasel Dunkel (5.4% ABV) – Mahogany-brown color. Toasty and smoky with a brown sugar/molasses finish. Medium to full-bodied, I wouldn’t recommend with a meal. Hawaii Five Ale (5.0% ABV) – Unfortunately, this was my least favorite beer of the bunch. I felt like I was drinking a fruit punch or fruity mixed drink instead of a beer. Medium bodied, much too sweet, and frankly rather sickening. If you like fruity mixed drinks or wine coolers, this might be the beer for you. If you like beer, you will definitely want to pass this one up. Saison De Russeau (5.2% ABV) – Coriander, orange spice flavor and aroma and a lovely maltiness really made me smile. I enjoyed this beer more than once on my trip. It was one of my favorites. Deadhead Double Red (10% ABV) – Dark red color and a toasty, malty body this puppy is definitely a sipper for the not so faint of heart! Beautiful Belgian lace coated the glass on the way down and I could rally taste the higher alcohol. But the red does have a sweet, brown sugar finish. Tripel (8% ABV) – Another “sipper” on the list was this really pretty tripel. With a peaches and honey aroma and taste this beer almost mimics honey mead. Spices cool down the sweetness. Tripel is quite enjoyable, but another beer you should not pair with food. Baldock IPA (6.5% ABV) – Another favorite was this nice IPA. Light hops, amber color with a toasty yet caramel taste with hints of grapefruit. Crisp, clean finish. Redbird Ale (6.2% ABV) – Just in time for autumn, this ale is toasty and crisp. Brown sugar aroma with a malty body and autumn leaves taste. Black Angel Stout (6.9% ABV) – The darkest of the bunch, this stout was ink black. Dark chocolate aroma and flavor with hints of coffee. A little on the bitter chocolate side with a strong toasty finish. My travel companions and I enjoyed this brewery and visited more than once. 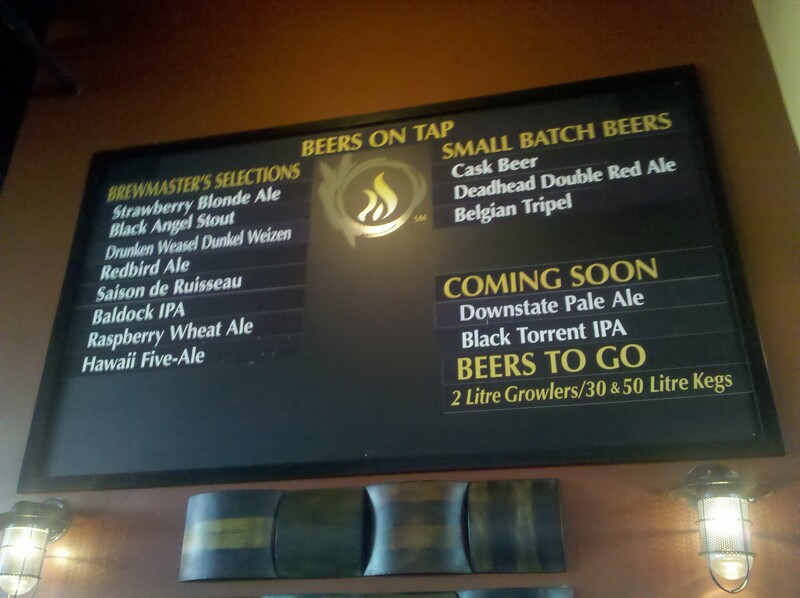 Destihl doesn’t have a taster tray but does serve all of their brews in a 3oz glass for $1.50 each. Not a bad deal! Great beers, great food, great atmosphere. Who knew the Midwest was so cool? Grant,I must say I was a bit disappointed that Only the Amber and the Russian Imperial were alavlabie. I have also heard excellent things about their Porter! They are sold in P.A. but not in my home state of N.J. yet. I was told they are pushing out their max capacity and have to add more tanks in order to be able to get into more markets. So hopefully in a couple years they will be in my Garden State! Cheers!